Do you want an amazing vacation in one of the most beautiful places on Earth? Santorini is definitely for you. Known to many as the best party destination in the world, it has something for everyone. 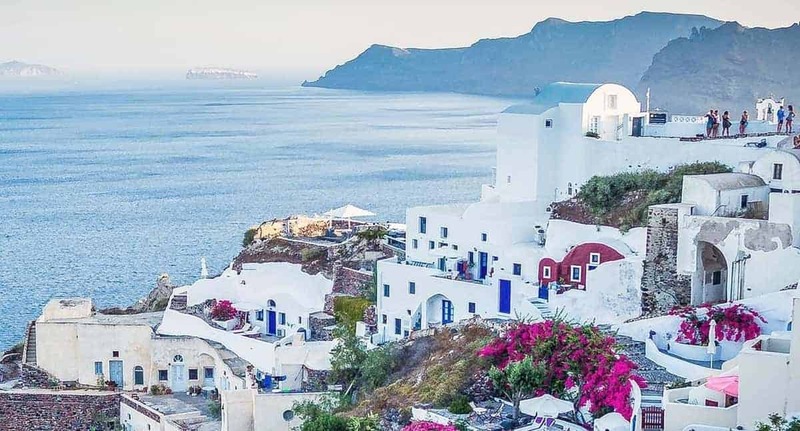 Whether you’re looking to spend a week or two sitting on pristine beaches, every night out on the town, or seeing natural and historical landmarks, Santorini has you covered. Take a look at some luxury Santorini holiday villas to book the perfect accommodation for your upcoming Santorini trip. Once you’ve done so, get your itinerary out and add these 6 incredible things to do. Santorini has in part been shaped by volcanic activity, and the Red Beach is perhaps the most striking indicator of this. The Red Beach is, naturally, surrounded by rock formations in varying red hues. It is simply stunning, and even those amazing photos do not do it justice. The interaction between the reds of the rocks, the blues and greens of the water, and everything in between, is more than Instagram fodder. It is beauty you have to see for yourself. Make sure that you wear sturdy shoes, as there is a bit of a trek to get to the beach itself from the parking. In peak season, it may be a bit crowded, but for good reason. You can spend the day by the sea, enjoying the crystal clear waters and experiencing the spectacle anew every time you open your eyes. It shouldn’t come as a surprise that some of the most significant archaeological discoveries have been uncovered in Greece. It was once the bastion of Western civilisation, and is home to a very storied history. Santorini is no exception. The Akrotiri prehistoric town is, however, far more remarkable than the relics from the democratic era. It is in many ways the Pompeii of Greece, considering it was taken by a volcanic eruption about 3,600 years ago. Home to 30,000 people, it left a major legacy, providing clues to a fascinating ancient civilisation. While most tourist attractions don’t require guides, a guide will make this experience far more meaningful. Without the context a good guide can provide, the town won’t make much sense to you. It is right near the Red Beach, and you can experience both of them in one day. When you imagine Santorini’s beauty, you probably picture the village of Oia. It is supposedly one of the most photographed places in the world, and for good reason. Its whitewashed houses, with blue shutters, have captured the imagination of people around the globe. You can spend days walking through the winding, narrow roads, stopping for a drink at a taverna or a peak at an art gallery every once in awhile. It is on top of a cliff, so not only is the village picturesque, but you get spectacular views as well. Millions of travelers have watched the sunset from Oia, and until you have, you have no idea how incredible a sunset can be. Unfortunately, you will have to deal with intense crowds at sunset time, but it is well worth it. Most of the time, I think cruises are overrated. The days-long type are pure hell, and in most places, a couple of hours on the water is nothing to write home about. However, you have to go on a sunset cruise in Santorini. Santorini is a place of spectacular beauty, and much of your time there will be spent enjoying that beauty. A sunset cruise is the peak of aesthetic pleasure. You get to see the island from the water, with its volcanic geography. It’s a lot to take in, and your time will be spent doing just that, with a glass of wine in hand. If you’re a wine lover, you will know that Santorini is famous for its wine. It has amazing vineyards, with wine tours available every day, that will take you through the history of wine production, dating back 3,500 years. If you’re not a wine lover, but you do drink, you should do a vineyard tour anyway, as you’ll get to learn all about the subtleties in different wines. You’ll learn to appreciate a good wine by the end of it. Some of us love adventuring on our own two feet while traveling. While I understand that not everyone wants to “exercise” on a vacation, for me there is nothing better than experiencing a place by walking through the scenery. In Santorini, there are a number of hikes you can do, and you don’t have to be an accomplished hiker. Skaros Rock is a popular hike. It used to be a fortress for the Venetian capital. The destination itself is fantastic, but the view of Imerovigli town is also great. Alternatively, take the trail between Oia and Fira. This hike will take around 3 hours. It is not difficult, but you do need to be a little bit fit to actually enjoy it. Along the way, you will see some incredible views of the island. At the end of it, you get to relax in Oia or Fira, where you can regroup and spend time exploring. Go early morning, and get your day off to an amazing start, or end the afternoon with the trek. Don’t go in the middle of the day, as you will struggle with the heat!